The ACE score is a measure that has been designed to measure the cumulative nature of childhood distress. Now add up your “Yes” answers: __________ This is your ACE Score. 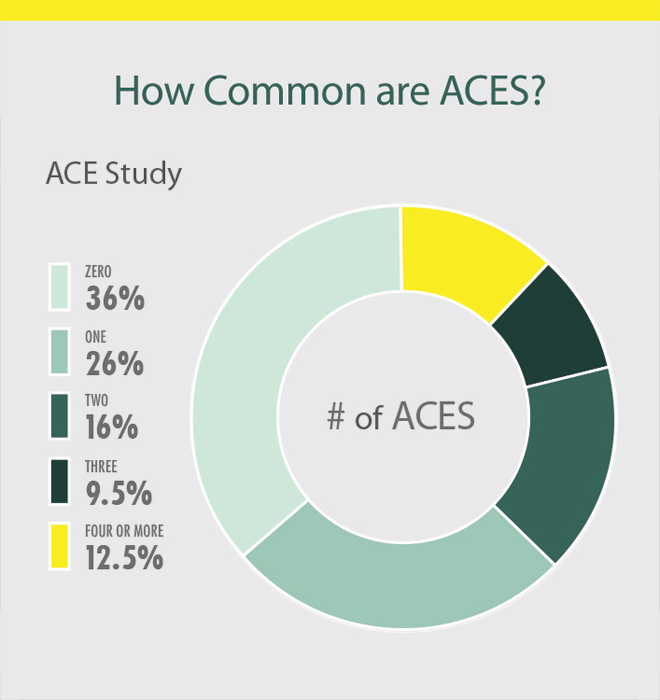 As shown in the graph from cdc.gov, 64% of the population surveyed experienced at least one adverse childhood experience(ACE), with the majority of those reporting at least one ACE reporting multiple ACEs. Beyond the ACEs study, at least one in four children will suffer from physical, emotional or sexual abuse at some point during their childhoods, with one-in-seven children experiencing abuse or neglect in the past 12 months (Finklehor, Turner, Shattuck & Hamby, 2015). Another long-term study indicated that approximately 80% of young adults who had previously been abused qualified for at least one psychiatric diagnosis at the age of 21 (Silverman, Reinherz & Gianconia, 1996). Neglected or abused children are also 59% more likely to be arrested during their childhood, 28% more likely to engage in criminal behaviour as adults, and 30% more likely to engage in violent crime as an adult (Widom & Maxfield, 2001). Individuals who have had negative experiences during their childhood can still grow and flourish as adults, and can also be more resilient as a result of learning how to overcome significant challenges when they are younger. A major longitudinal study even found that what goes right during childhood is often more important than what goes wrong, and having even one safe, stable and nurturing figure in a child’s life can reduce the later risk of psychological and physical health problems (Vaillant, 2015). Abuse and neglect during childhood can also negatively impact the ability of individuals to efficiently establish and maintain healthy romantic adult relationships (Colman & Widom, 2004). 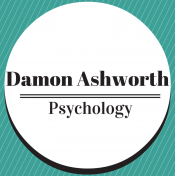 As relationship warmth and social connection are vital protective factors for long-term health and happiness, many of these more significant risks could at least be partially explained by the higher risk of interpersonal conflict, disconnection and isolation. 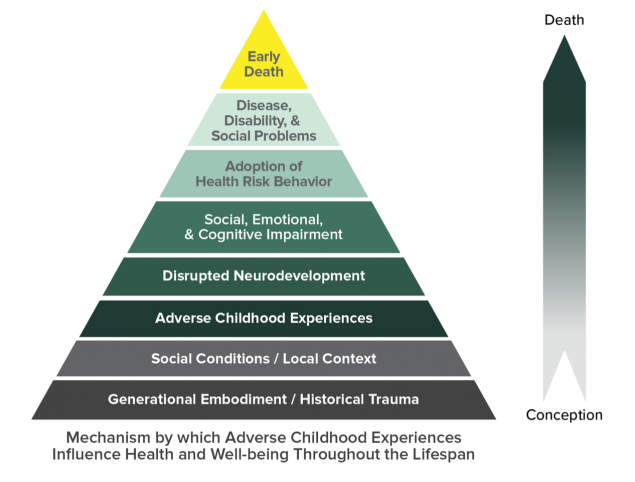 A “dose-response reaction” exists with most risk factors and following conditions, in that the more adverse childhood experiences one has, the higher their risk is for adverse outcomes later in life, as shown in the above graphic from cdc.gov. Childhood abuse and neglect are not just damaging to the individual. They also place a substantial financial strain on society, with an estimated total lifetime economic burden of approximately $124 billion (2010 dollars) in the US in 2008 (Fang, Brown, Florence & Mercy, 2012). This is similar to the financial burden of other public health issues, such as diabetes and stroke. The main reasons for the increased economic burden are lost productivity, followed by increased medical costs, special education, child welfare and criminal justice costs (Fang, Brown, Florence & Mercy, 2012). Even though it may be expensive to develop and implement programs that aim to prevent child neglect and abuse, the benefits of these programs, if valid, are very likely to outweigh the costs in the long-run. Creating safe, stable and nurturing environments (SSNREs) is the key to having a positive impact on reducing ACEs going forward. More financial support for low-income families. Please help to get this information out there to as many people as possible. If you found something of value in this article, please share it or pass it onto whoever else may benefit too! Reblogged this on こんにちは Konnichiwa!. WOW! I hope the “right” people that need to see this post can!!!!! I knew that I had not had a bad childhood but I didn’t realize what a GOOD childhood I did have! There were a lot of Jigs and Jags and loss and learning…………..but never abuse or absence of love! Blessed indeed! This is so important! I have an ACE score of 7, my husband got 9. We are striving to insure that our children never have to answer yes to any of these questions. Thanks for bringing awareness to this crisis. Great summary and stats about important issues related to ACEs. Thanks for collecting and posting. Will be sharing (and crediting you) in my next post on these topics. I’m researching the protective factors /resilience aspects, trying to find out more about the reasons everyone with high ACEs does not experience so many negative outcomes in adulthood (or earlier). Any references welcomed. I don’t have any references on that, but I’d love to know what you find out!